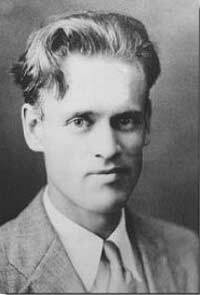 When he was 15 years old, Philo T. Farnsworth drew something on the blackboard in chemistry class that would change the world. It was an “Image Dissector” and it was young Philo’s idea for electronic television. Years later, his chemistry teacher redrew that sketch and helped Farnsworth win a long courtroom battle against the Radio Corporation of America (RCA). Farnsworth was born in Utah on 19 August 1906 to a large family of Mormon farmers. Farnsworth had a great memory and easily understood mechanical machines. As a kid, he looked for ways to do his chores faster and automated his mother’s washing machine and some of the farm machinery. While the machines did his work, he tinkered in the attic. One day, after looking at the pattern created by cutting rows of hay in alternating directions, he came up with the idea of creating television images by scanning a picture in horizontal lines. Farnsworth first proposed his TV system to his chemistry class in 1922. After that, he raised money from friends to build his TV system. Meanwhile another inventor, Vladimir Zworykin, developed an electronic TV for his employer, RCA. Farnsworth received a patent for his electronic camera tube, the Image Dissector, in 1930 at the age of 24 and became a media star. 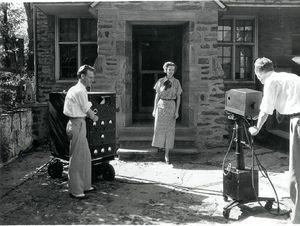 Zworykin applied for a patent for his TV camera, the Iconoscope, in 1923; but his patent was not granted until 1938 because of Farnsworth’s. RCA’s long-time leader, the hard-nosed David Sarnoff, fought Farnsworth’s patent claims in court for years. In 1939, Farnsworth won. It was one of the few times that an opponent bested Sarnoff. Farnsworth’s victory meant that one of the biggest companies on earth would have to pay Farnsworth for the right to make televisions. Soon after, with World War II looming, the United States government stopped television development. Television manufacturing didn’t start again until after the war. By then Farnsworth’s patents expired and his company collapsed. Farnsworth sacrificed a lot to work on television. He even skipped his infant son’s funeral to work. Over the years, he wondered whether television was worth all the personal sacrifices and he sank into a deep depression. Farnsworth felt somewhat vindicated when he watched a man walking on the moon in 1969. His hard work had contributed to the event. Time magazine called Farnsworth one of the best mathematicians and inventors of the 20th century. Philo Junior described his father as having a “romance with the electron.” That romance resulted in his earning over 150 patents for TV, amplifiers, cathode-ray tubes, vacuum tubes, fusion reactors, satellites, and more. Farnsworth died of pneumonia in Utah in 1971. This page was last edited on 16 February 2016, at 18:45.